Jared Mitchell, OF – The 23rd overall pick in the 2009 draft had his career interrupted when he tore an ankle tendon in the spring of 2010. He wasn’t the same in 2011, however was very impressive in the winter instructional league and warranted a promotion to AA. He will be interesting to follow this season as he has tons of potential. Trayce Thompson, OF – The 2009 2nd round picked didn’t really impress in 2009 and 2010. However, some of that changed after hitting 24 HRs in 2011. His batting average as awful and his K rate was extremely high. The 21-year-old remains a good talent and will get time to work out some mechanical issues in the Carolina League. Kevan Smith, C – Mature college catcher with power to all fields. He has the bat but is still learning to be a professional catcher. Jordan Danks, OF – Has some pop and speed. He wasn’t much of a prospect and after 2 full seasons at AAA, the 25-year-old doesn’t figure to be a major league regular. Still, he will have an opportunity to find himself on the bench as a 4th or 5th outfielder before the season is over. White Sox Minor League pitcher Terry Doyle, catcher Josh Phegley, infielder Tyler Saladino and outfielder Brandon Short will be part of the Mesa Solar Sox in the 2011 Arizona Fall League. Triple-A Charlotte skipper Joe McEwing will be the club’s manager. The AFL starts on October 4 and concludes with the AFL Championship on November 19. UPDATE: Seems the Sox will send 3 more pitchers to Mesa. Danks will be making the first trip to the disabled list in his nine-year professional career. Left-handed reliever Hector Santiagohad his contract purchased from Double-A Birmingham to replace Danks.Santiago, 23, has split the season between Class A Winston-Salem and Birmingham, going a combined 6-5 with a 4.08 ERA and 73 strikeouts in 14 starts during his first season as a starter. The 6-foot, 210-pounder was 2-3 with a 3.68 ERA in eight starts with Winston-Salem and 4-2 with a 4.58 ERA in six outings with the Barons. Santiago was a reliever until this year. He added a screwball this year. “I haven’t quite figured it out yet,” Barons catcher Josh Phegley told the Birmingham News. “It’s a pretty interesting pitch. Other White Sox links: James has fun with arbitrary dates, Sergio Santos hasn’t changed, A.J. Pierzynski is balancing his hands, Don Cooper says the 6-man rotation will stick around for a while, and Josh Phegley has good day at the plate and says he always goes after the first available fastball he sees. Jose Martinez, OF, White Sox (High-A Winston-Salem): 3-for-5, 2B, 3 R. He doesn’t have the wheels anymore, but other tools are in place; 22-year-old is up to .434/.492/.604 in 13 games. Josh Phegley, C, White Sox (Double-A Birmingham): 2-for-5, 2 HR (3), 2 R, 4 RBI. Few doubted he could hit coming out of college, but questions about receiving skills remain unanswered as he’s committed 12 errors and been charged with 23 passed balls in just 91 career games behind the plate. Small problem: Martinez’ BABIP is an astronomical .479. And here’s Mayo’s White Sox OMG (One More Guy): Jacob Petricka, RHP. More of a right-handed Wade Boggs type than a power hitter at the hot corner, Morel is ready to take over at third for the White Sox. He’ll hit for average, as his .305 career mark shows, and he’s an outstanding defender, one who could even play shortstop if needed. Wade Boggs? Did Kenny Williams made a deal with the devil? 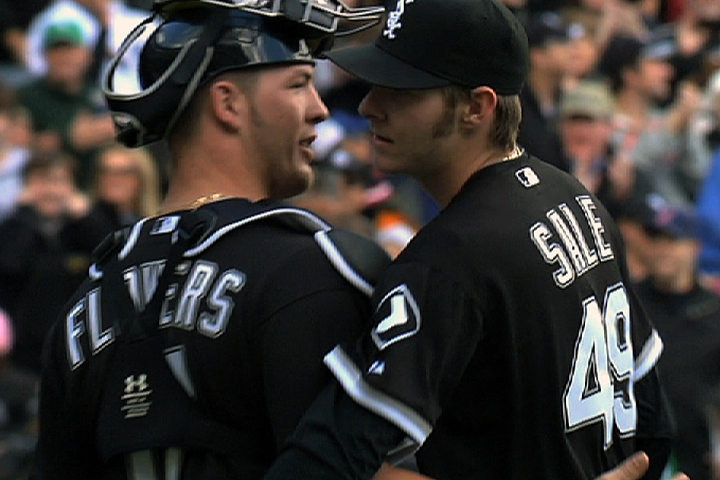 9 more and Goldstein’s scouting report on Chris Sale at the link. UPDATE: Goldstein discusses the White Sox Top 11/20 on Episode 25 of his podcast (mp3). The White Sox discussion is at the 72:30 mark and runs for about 12 minutes. The Chicago White Sox have agreed to terms on minor-league contracts with right-handed pitchers Brian Bruney, Jeff Gray, Josh Kinney, Shane Lindsay and Miguel Socolovich, catchers Donny Lucy and Jared Price and infielder Dallas McPherson. All eight players, in addition to six players within the White Sox system, have received non-roster invites to the club’s spring training camp in Glendale, Ariz.
Right-handed pitchers Kyle Bellamy and Brandon Hynick, left-hander Charlie Leesman, outfielders Jordan Danks and Brandon Short and catcher Josh Phegley all received invites to major-league camp from within the organization. Five of the 14 spring training invitees have major-league experience. … White Sox pitchers and catchers report to spring training on Thursday, February 17, with physicals and a workout scheduled for the same day. Position players will report and undergo physicals on Tuesday, February 22. The first full-squad workout also will take place at that time. Josh Phegley’s platelet count has spiked up after his operation! … Strong support from his family helped Phegley deal with the setback. He also learned more about how the game is run after being forced to the sideline, where he watched intently and studied the decisions made by his managers and coaches. Most of Phegley’s treatment took place at Wake Forest Baptist Hospital, and Phegley gave huge credit to the White Sox organization for its ongoing support. As an up-and-coming White Sox prospect, Phegley was scheduled to take part in the Arizona Fall League so that he might pick up missed at-bats, but instead of trying to get the ITP under control while also playing baseball, Phegley went home to focus on getting well. “At the beginning, it was so surreal that it didn’t hit me that it was that big of a deal. You have this life-threatening illness, but you feel 100 percent normal,” said Phegley, who has been working out for the past month and only has to guard against certain bacterial infections that could do damage without the counteracting antibodies produced by his spleen. “It happens to thousands of people per year. It’s like a genetic thing. White Sox catching prospect Josh Phegley is making a strong recovery after his spleen was removed Nov. 5 in Chicago. The procedure was done after Phegley and the Sox’s medical staff consulted with several experts who concluded that this was the best chance for Phegley to overcome Idiopathic thrombocytopenic purpura (ITP), a condition that results in a low blood platelets. The belief was that the platelets were being destroyed in the spleen, agent Joe Bick said. This condition forced Phegley, a 2009 supplemental first-round pick, to miss the first part of the 2010 season in the minors. It resurfaced on the morning of opening day of the Arizona Fall League season and caused Phegley to be removed from the Peoria Saguaros’ roster. Phegley has resumed workouts, and his platelet counts are “real good,” according to Bick. Let’s hope Josh has a totally successful recovery.